California Beach01493 846346work BeachCalifornia Beach near Great Yarmouth is a lovely, wide, sand and shingle beach at the bottom of low sandy cliffs, merging with Scratby Beach. 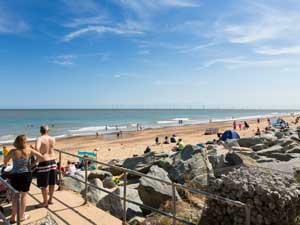 Peaceful and picturesque part of the coastline accessed via steep steps down the side of the sandy cliff or can be pleasantly walked to from Caister along the beach. Light rereshments are available at beach entrance point along with public & disbled toilets. Public parking is very limited. California Beach near Great Yarmouth is a lovely, wide, sand and shingle beach at the bottom of low sandy cliffs, merging with Scratby Beach. Disabled access is by steep slope and stairs and may not therefore be suitable for all levels of disability. Take the A47 to Great Yarmouth. At the roundabout follow the signs for the A149 to Caister. At the roundabout take the exit marked A149, Caister Bypass. At roundabout take exit marked Hemsby. Turn right onto California Road, beach entrance is just past California Tavern. First Bus No 1 operates to California, please check details before travelling.